Friends of GNOME ruler launched. The campaign has been a great success so far – thanks, everyone! Jeremy Allison joined the GNOME Advisory Board representing Google. Worked with a potential sponsor. Met with Rosanna to discuss the things she’s got going on (invoices, reimbursements, bank stuff, etc) and the Friends of GNOME gifts. Proposed that maybe we could send gifts via a supplier like Amazon. Having too many gifts to send out is a good problem to have! Met with Brian Cameron to discuss my work. It’s about time for a midyear review. Sent lots of thank you’s to Friends of GNOME who donated. Thanks, everyone! Discussed a couple of GUADEC things like press. Need to wrap up the sponsors. Attended GNOME Foundation IRC meeting. Discussed who could attend FOSS Nigeria as the person who was going to attend on GNOME’s behalf had to cancel for work. Organized a Women in Technology happy hour with Julie Bort in Fort Collins. Not GNOME related all though all GNOME women are welcome! Reviewed GNOME 2.30 release notes and Project Accessibility & GNOME press release. Wrapped up an advisory board interview for GNOME Journal. Decided to move the Meet the Funders event to the fall. That will avoid conflict with lots of summer conferences and enable us to plan in person at OSCON. Interviewed with a Northern California radio show on women and Unix and Linux. Met with an analyst trying to figure out how many Linux mobile devices there will be. Attended FSF Women’s IRC meeting. Sounds like the women’s track at Libre Planet was a great success! Attended Open World Forum committee meeting. Haven’t yet committed to helping any particular track. Review my very long todo list and make sure I’m working on the most important stuff. Start a conversation on GNOME Mobile about what to do with the Nokia funding. Try to close with all GUADEC sponsors. 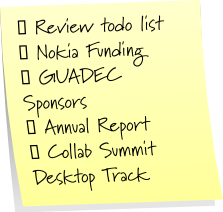 Work out a schedule for the Linux Foundation Collaboration Summit desktop track. 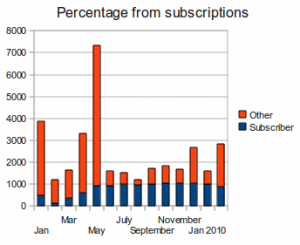 From last year: 2009 was an awesome year thanks to our Friends of GNOME. We brought in $29,578!!! We lost 12 subscribers. I asked them all why they cancelled. Few have responded but I imagine that it’s because they finished their year and they are getting a tshirt. These reports currently don’t include $100 a month that we receive in donations via checks. And as you can see, 2009 was a stellar year. We have a lot to live up to! Project:Possiblity just hosted the first ever SS12: Code for a Cause. SS12 is a programming competition where teams of students compete to code open source software for persons with disabilities over the course of a weekend. Teams of students working with GNOME’s Caribou took first place at UCLA and second place at USC! Thanks go to Stanley Lam and Steve Lee for not only making the project happen but getting GNOME involved. Thanks go to GNOME accessibility hacker Ben Konrath for mentoring the students over the weekend. You can read more about it in this newspaper article, the “existing on-screen keyboard” is GNOME Caribou. The students from the winning teams will be at CSUN, the 25th Annual International Technology & Persons with Disabilities Conference, where they will meet with the GNOME developers attending CSUN and the GNOME a11y hackfest. I hope they decide to continue their work on GNOME accessibility – they are doing a great job! Magnatune is an independent record label that aims at treating both its musicians and its customers fairly. There is a Rhythmbox plugin that enables users to browse the Magnatune music store, listen to full tracks, and purchase albums. Our friends at Magnatune decided that 10% of every purchase made through Rhythmbox will go back to the project, and after some discussion, the Rhythmbox team decided to donate this money to the GNOME Foundation. John Buckman announced yesterday that he will therefore send a $614.20 check to the GNOME Foundation, which was a great surprise! John’s post has some more interesting statistics about how many albums were purchased. We’re really grateful to Magnatune for their support, and we’d like to also thank the Rhythmbox team for choosing to donate this money to the GNOME Foundation! We think such inventive ways to help fund free software projects are promising, and we will make sure to use this money to help make a difference for the GNOME project. Christophe Fergeau, one of the Rhythmbox hackers, has a post on how you can contribute to improving Rhythmbox with hardware donations. Michael Meeks joined the GNOME Foundation Advisory Board representing Novell, replacing Gary Ekker. Set up some surveys for the board directors to give feedback on each others’ performance. Way too much time and energy on Foundation List threads. Really liked Dave’s post about consensus driven conversations. Hopefully everyone follows Vincent’s advice and refocuses on making GNOME rock and making the GNOME project a fun place to work. Short meeting with Jorge Castro who’s been really busy in his new board role! Meeting with Rosanna. She’s adding info to the CRM system. I’m trying to help her with Friends of GNOME. Planning a trip to Boston to get on the GNOME Foundation’s bank account. Looking for someone to help out with the GNOME booth at Texas Linux Fest. Meeting with Jeffrey Altman about the Meet the Funders event in New York. Set up some meetings for my trip to San Francisco and Open Mobility next week. Wrote thank you emails to people that donated to GNOME. Generated Google Adwords Campaign Tracking code. Gave it to Jaap and Claus to add to our Friends of GNOME pages. Sent questions to advisor interviewee for Board of Advisors GNOME Journal interview. Generated Friends of GNOME February data. Need to blog about it on Foundation blog. Tried to take a day off to deal with doctors’ appointments and dentist appointments and accountants among other things. Trip to San Francisco. Speaking on a panel at Open Mobility. Get the Meet the Funders event planning moving. We’ve scheduled them for May. Continue to work on GUADEC sponsorships. Try to touch base with a few GNOME Board of Advisors folks. Write letter for annual report. Blog about February Friends of GNOME data. This last February 27th Chile was hit by a 8.8 magnitude earthquake. GNOME is not removed from this tragedy since it has always relied on the invaluable friendship and collaboration from developers and users in Chile. This value became evident when just moments after the earthquake when people in the GNOME community first started to express concern and worry about our friends in Chile. From GNOME we would like to send all our sympathy and support to our friends in Concepción, Curicó, Talca, Santiago, Viña del Mar, Valparaíso and everyone in Chile. El último 27 de Febrero Chile fue golpeado por un terremoto de magnitud 8.8. GNOME no es ajeno a esta tragedia ya que por años el proyecto ha contado con la invaluable amistad y colaboración de desarrolladores y usuarios chilenos. Esta gran importancia fue evidente cuando apenas a momentos de sucedido el terremoto los mensajes y llamadas de preocupación por ustedes comenzaron a circular y no se han detenido aún. Desde GNOME queremos enviarles todo nuestro cariño y apoyo a nuestros amigos en Concepción, Curicó, Talca, Santiago, Viña del Mar, Valparaíso y todo Chile. I think the number of different projects and conversations I am having has maxed out my multiprocessing capabilities. This week I am going to spend more time logged out of email and working on one project at a time. Presented at IASA. Great conversation. Very interactive group. Made a couple of local government contacts – people involved in promoting open source in government IT infrastructure. Attended OSS Watch phone Advisory Board Meeting. Worked on GUADEC sponsorship. It’s coming along well. Still waiting for a lot of people to finalize plans through. Advisory board meetings. Met with several more adboard members – still haven’t met with everyone though! Several good meetings with Rosanna. Updating the Friends of GNOME gifts spreadsheet for Rosanna (ping her a lot with questions.) I sent her the list of Friends of GNOME Adopt a Hacker folks who have earned their tshirt! Sent new Adopt a Hacker folks contact info to people that will send them post cards. Settled on date and location for Meet the Funders in California. Need to finalize date for New York. Looked into adding conversion tracking to our GNOME ads on Google Adwords. Attended Women’s Caucus meeting. They will have an all day track Sunday at Libre Planet. Attended the Grace Hopper Open Source track committee meeting. Didn’t attend the OpenWorld Forum meeting as they only dial in number was an international number. Agreed to give GNOME keynote at LinuxTag. Johannes Schmid agreed to put together the GNOME track. Please contact him if you are interested in speaking about GNOME at LinuxTag. Sent out thank you email to Friends of GNOME. Worried about all the GNOME folks in Chile. I think we are almost ready to launch the Friends of GNOME ruler. At least it looks very good and I wrote an intro email for the launch! Students on Project Possibility picked several GNOME projects – work on Caribou and Orca. Worked on GNOME’s participation at Idlelo 4. Had a gazillion email conversations on a trillion different topics. Friends of GNOME & Google ads: conversion tracking codes and landing pages. Finish Friends of GNOME gift spreadsheet update. I get very little feedback to these updates. Feel free to leave feedback, ideas or comments!